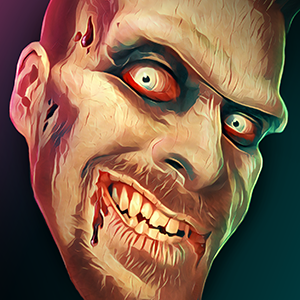 Ryan's 2018 Halloween Costume - The Goblin - Zombie Pumpkins! 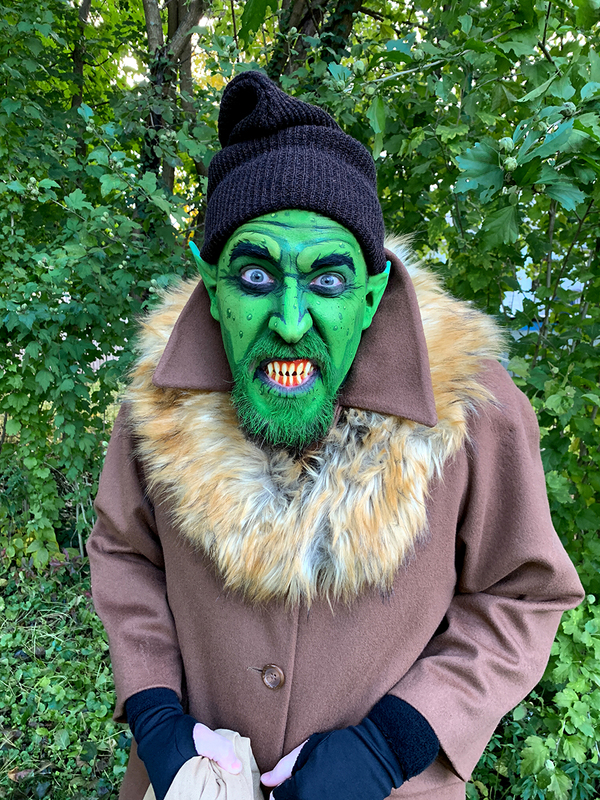 For Halloween 2018 I was a goblin. Goblins don't have a sweet tooth for candy. They prefer bad food. Specifically naughty children. 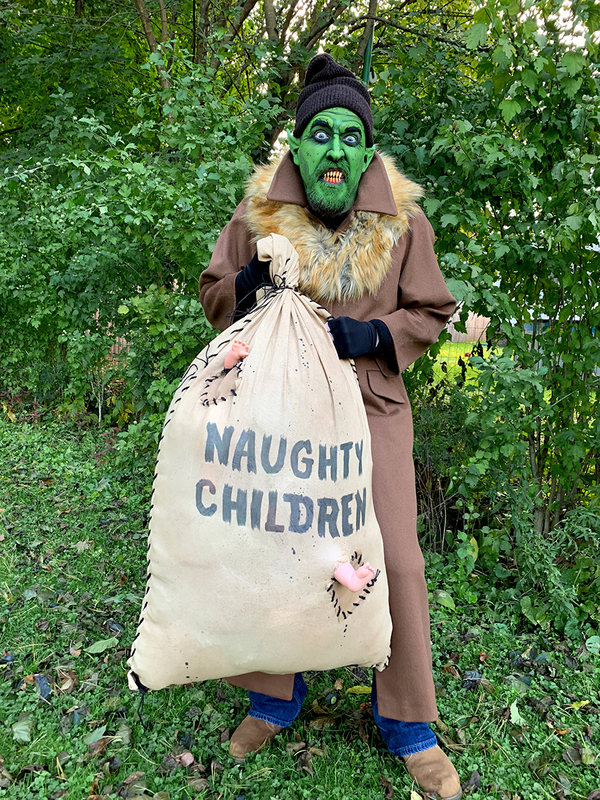 I left my forest hut to go trick-or-treating in human neighborhoods, going door-to-door collecting kids to fill my bag. The trick-or-treaters on Halloween usually approached and just starred at me with wide eyes. Almost all the kids were polite, but if I saw a kid shoving in front of others, I would just point to my naughty children bad, with a warning look. 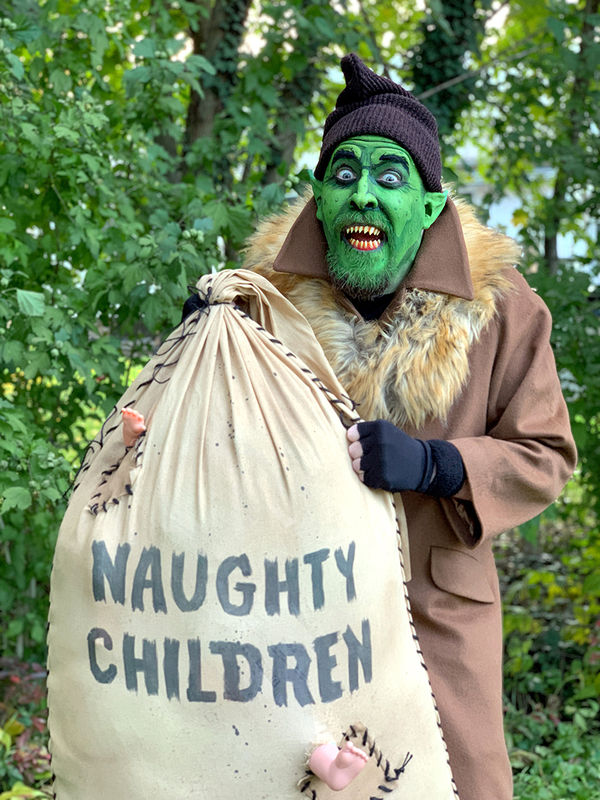 I thought it might be awkward to threaten to eat strangers' children, but almost all the parents seemed eager to give up their kids to my collection. One particular little girl was pretty funny... she must have been around 7-years-old. She said with a lot of sass, "You were a vampire last year, weren't you? You play to much. You're creepy." 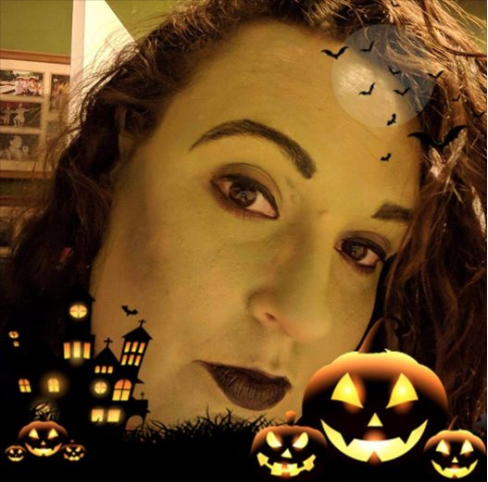 I said, "It's Halloween, it's the perfect time to pretend." 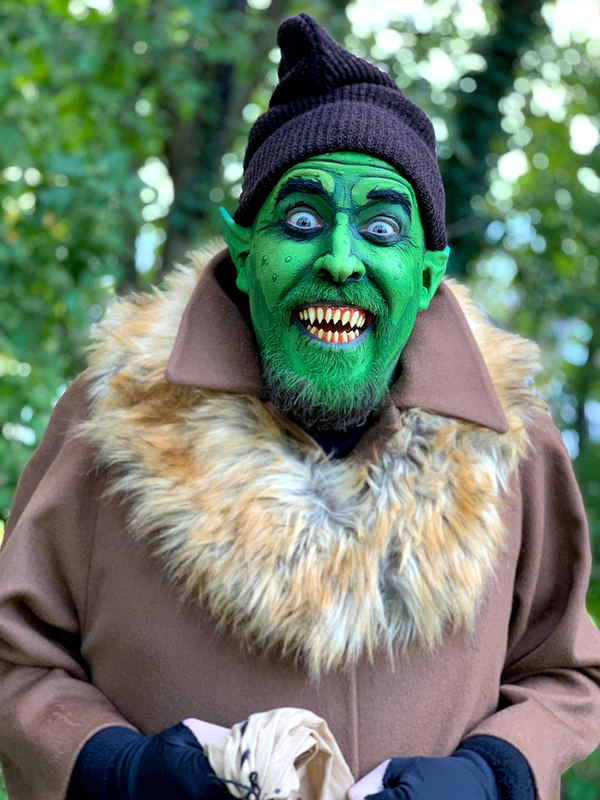 I got a lot of compliments on the pointed teeth and ears - the easiest parts to just stick on, the makeup was the more skill-based part which took 90 minutes. But I got remarks on that too. Some people were trying to figure out if that was my real face or a mask, which is a good compliment. I don't know what inspired me to be a goblin for Halloween 2018, but the idea just popped into my head in early October, and over the next few weeks I gradually visualized it in my head, and collected parts. A floppy winter hat, a coat from Goodwill, and a fur collar (I imagined this goblin lived in the woods, and maybe kept warm with wild animals). 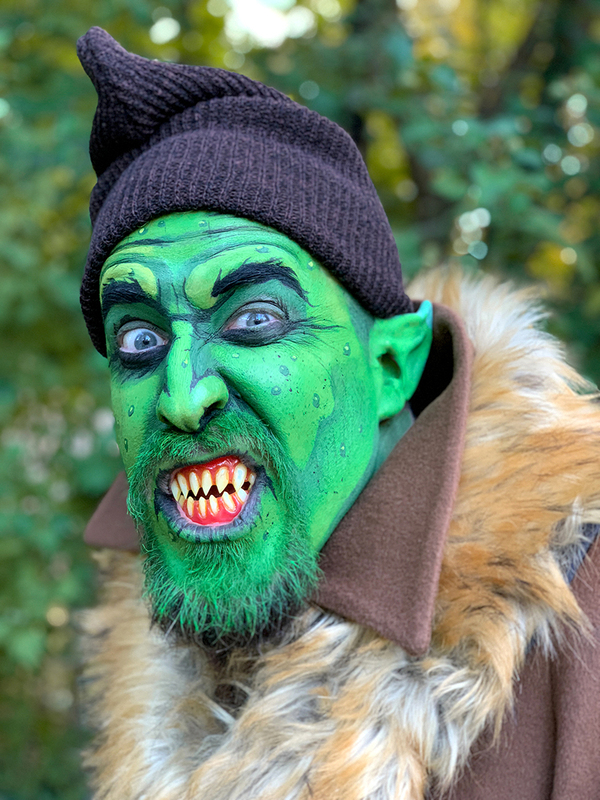 The teeth are by Dental Distortions (the "Gaul" model), the green ear tips are by Woochie (the "Troll" model) and the water-activated face paint is Mehron Paradise Makeup AQ. 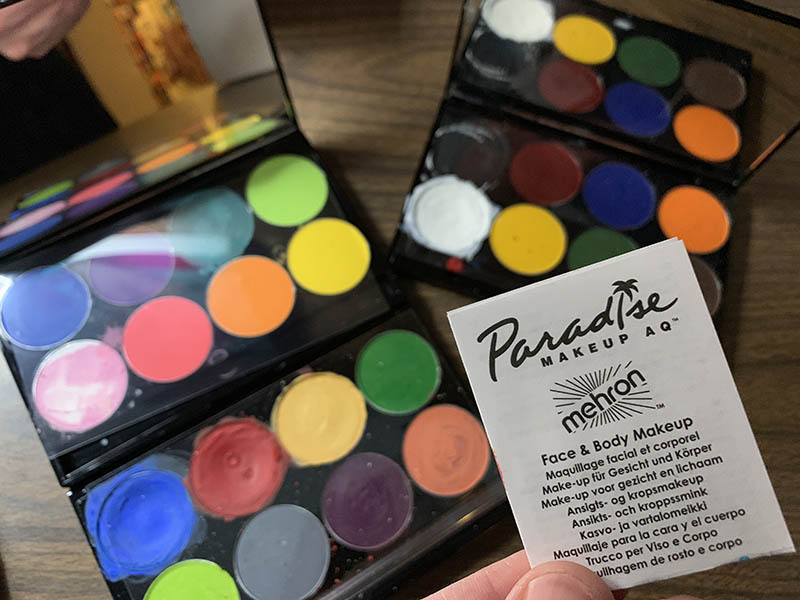 A few shades of green eyeshadow for highlights and shadows, and a black liquid eyeliner for illustrative wrinkles and cracks. 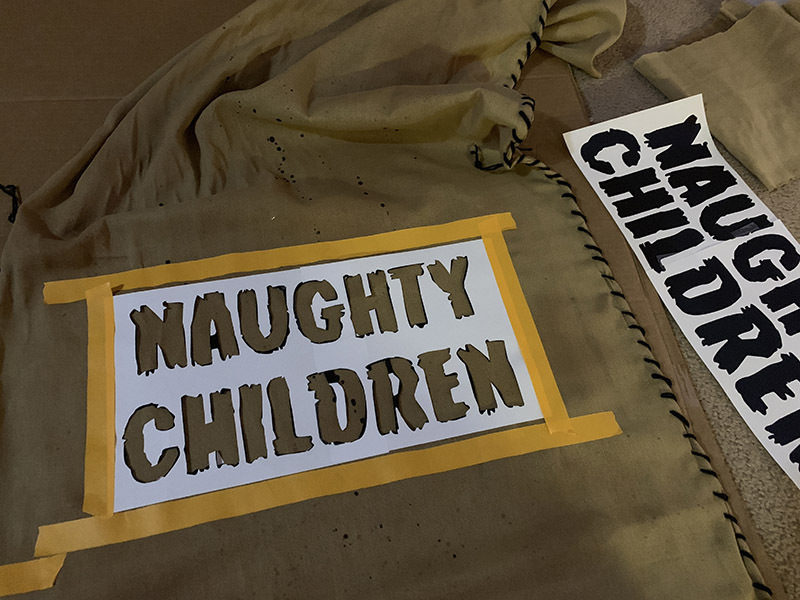 A big (literally and figuratively) part of my costume was this "naughty children" bag. 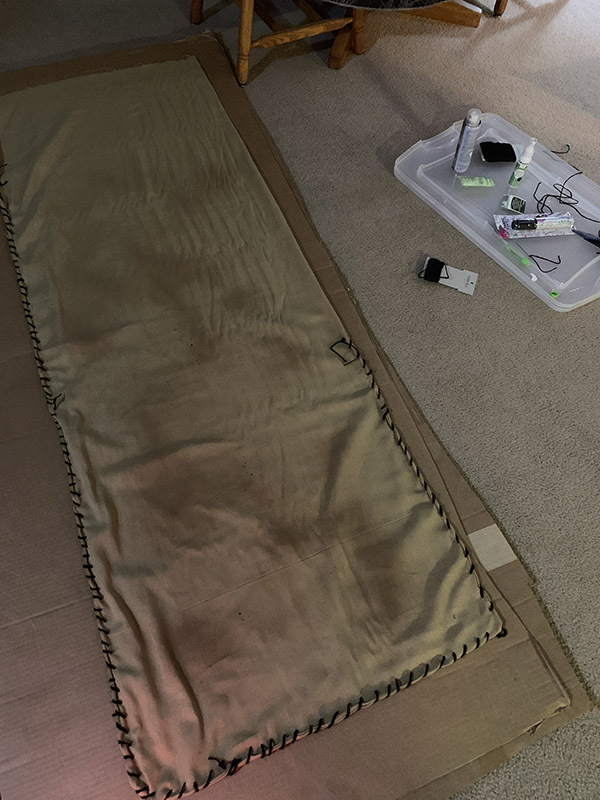 The bag was made from a couple yards of textured brown fabric, I sealed the edges with a fabric glue, then sewed a sloppy stitch with thick black string. I uses some fabric spray paint to make it look dirty. Then I stenciled on the letters with a fabric marker. The bag is filled with those air pillow cushions used for packing materials (thank you Amazon) and a few plastic dolls with their limbs sticking out. Thanks for looking. Be good! I love it, wish we had of gotten a pattern of it. Atleast you left enough of an impression on that 7 year old that she remembered your costume last year. One of the top 3 costumes youve done. I always enjoy a costume that focuses on child torment - a theme close to my witchy heart! Your makeup looks amazing - I need to try this idea out myself! Ryan, May I give you the ultimate compliment by trying to duplicate your wonderful creation next year? It was my first Trunk-or-Treat and Haunted Hall I helped with at church this year, and my decorated and monstered classroom was avoided by many, including some adults. I thought it was rather mild, but, different strokes, as it goes. A lot of kids were too scared to get the candy out of my trunk...and they were the full-sized candy bars! The turn-out was beyond my wildest hopes, so 2019 should be a killer year! I would love to roam the area in a get-up like yours! It would give the ToTers something to tell their therapists later. And it could reduce my candy bill. Great costume. Would make a nice pattern too. ABSOLUTELY! We need a creepy goblin pattern.